Private collection, Austria, until 2018. This painting, which considering its age is in remarkable condition, is a particularly fine example of the artist’s work, exemplifying the haughty swagger that he was able to capture in paint. Painted in 1581, the year Gower was made by royal appointment Sergeant-Painter to the queen, it is an important addition to the artist’s oeuvre, and was, prior to its discovery late last year, completely unknown. Although it might be argued that George Gower’s rivals achieved greater levels of illusionism and more painterly effects, none could rival his style and finish. His popularity with the queen ensured that he was cast as the principal architect of her iconography and remained the preeminent painter at Elizabeth I’s Court for much her reign. Here, the courtly aspirations of George Goring are vibrantly captured by Gower in the sitter’s resplendent costume; his fine lace cartwheel ruff and black velvet cloak embroidered in silver and gold thread with grape vines and acorns are worthy of the Elizabethan courtier he aspired to be. Golden acorns further adorn his doublet and the buttons themselves are acorn-shaped, all symbolising his pedigree as a ‘great oak’. The silk of his under-shirt peaks through his right sleeve, unbuttoned to reveal the embroidered letters ‘A’ and ‘D’, the initials of his wife, Anne Denny. Anne was undoubtedly a catch; the daughter of one of Henry VIII’s most trusted ‘gentlemen of the chamber’, Anthony Denny (1501 – 1549) of Waltham Abbey, Essex. As Keeper of Hatfield House where the young Elizabeth spent much of her childhood, and then of Westminster palace and Henry VIII’s royal household, Denny rode in the carriage with the late king’s body at his funeral, and was a pall-bearer at Edward VI’s coronation. Though he died before Anne came of age, this royal connection and indeed the wealth that she brought to Goring, were essential in elevating our sitter to the point we see here, the (presumed) year of their marriage, 1581. George Goring Junior, MP for Lewes in 1593 and 1601, was the eldest son of George Goring (c.1522 – 1594), also an MP for Lewes (elected to the English parliament in 1563). Goring Senior purchased an impressive estate, Danny Park in Hurstpierpoint, West Sussex, a year after his son’s marriage, in 1582. There, at great expense he built Danny House, designed in the shape of the letter ‘E’ in honour of Elizabeth I of England, who had been on the throne for over thirty years. The house was finished in 1595, a year after Goring Senior’s death, at which point Goring Junior became responsible for his father’s debts, amounting to the substantial sum of £20,000. This was added to his own debts (£16,000), which, like his father, he had accumulated as a speculator in land. Through favourable connections (probably Sir Robert Cecil to whom he and his wife regularly sent presents in gratitude), he managed to avoid the forcible sale of his father’s lands, though they were extended and an annual sum appointed for payment to the Queen. In 1596 Sir Walter Raleigh allowed Goring to try to repair his fortunes by prospecting for iron on some of his lands in Munster. Goring died on 7 February 1602, leaving lands in Dorset, and some recently purchased in Sussex, to his brothers-in-law and to one William Newton, for the payment of his debts and the provision of portions for his four daughters. 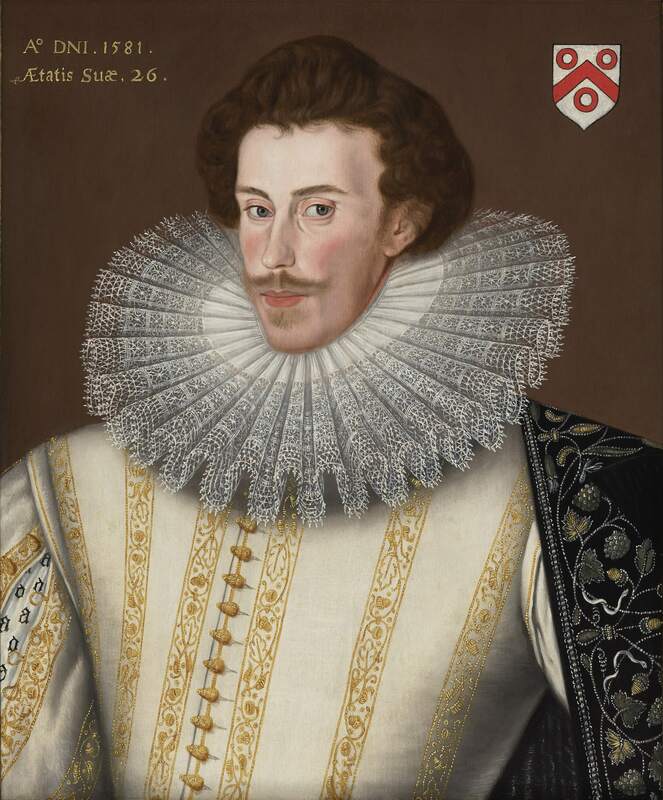 Anne was left as sole executrix, with the house at Danny Park until their eldest son George reached his majority. Colonel George Goring, 1st Earl of Norwich (1585 – 1663), like his father and grandfather, was an MP for Lewes. He was knighted in 1608 and became a favourite of Charles I of England, taking a prominent royalist role in the Civil War of 1648. A witness and an executor of Henry VIII’s will, he received a legacy of £300 which was not paid until 1550, after his own death. After four generations of Gorings, Danny was sold to Peter Courthope in 1650.